The Hornet will be one of numerous rare items collected by Wheeler during his career. The online auction will begin Nov. 6 and continue through 6 p.m. November 18, with Iron Horse Auction Company conducting the online event. “Mr. and Mrs. Wheeler are moving to a smaller home in keeping with their current needs, and they simply can’t take their entire collection with them. This is a rare opportunity for race and movie fans alike to bid on unique items from the collection,” said Will Lilly, who is managing the auction for Iron Horse. The real-life story of the Hornet is almost as fascinating as the movie. 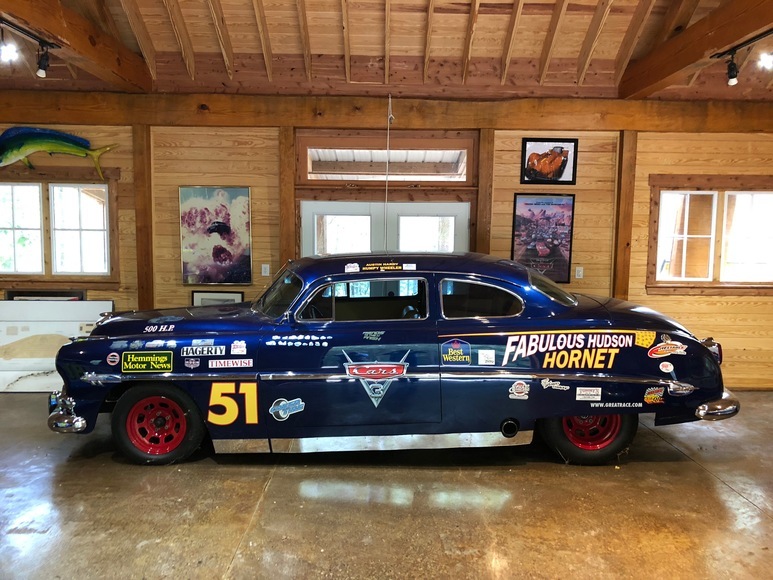 Wheeler purchased a 1953 Hudson Hornet, then obtained the rights from Disney Pixar to turn it into a replica of the movie Hornet, whose voice was provided by Paul Newman. “Only two such replicas exist – the one Mr. Wheeler is selling and the one owned by Disney Pixar,” said Lilly. Wheeler restored the car to run The Great Race (formerly the Great American Race) for vintage automobiles 45 years old or older. “He wanted to run it in 2014 with his grandson, and as part of the restoration, he obtained a 550-horsepower engine from the legendary Hendrick Motorsports team,” said Lilly. The Hornet and other items will be available for inspections from 10 a.m. to 4 p.m. November 9 and 12 at 10950 Arthur Auten Road, Huntersville. Individuals seeking additional information may visit ironhorseauction.com or call 910-997-2248.